Playing God by reversing time is possible in a limited way by recording and playing back acoustic waves in the inverse order to their reception. This method, known as time reversal acoustics, is in regular use on millimetre or longer length scales in medical acoustics or geophysics, for example, and works best if there is a scattering medium that can randomize the waves. 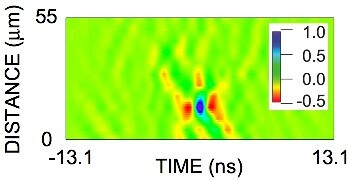 We have now devised a way to execute time reversal acoustics with unprecedented spatial resolution, which should prove useful for evaluating microstructures. The problem with applying time reversal acoustics to such small structures was to find a way to locally record and play back sound waves up to gigahertz frequencies (1 GHz = 109 cycles/s) at a number of points in a medium in a convenient way. This is rendered possible by the use of an ultrafast optical technique. Ripples on a sample full of tiny holes that scatter the surface acoustic waves. The image covers a 100 μm×100 μm region. 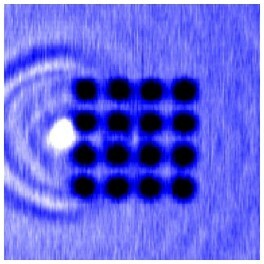 An ultrashort laser pulse striking the sample at a source point to the left of the hole array generates surface acoustic waves. This image shows the ripples thus produced on the sample—a silicon wafer embedded with 16 holes of diameter 8 μm. The acoustic waves are first recorded at a series of points arranged in a vertical line through the centre of the array of holes. The waves are then time-reversed and played back by a computational method. The image below shows the resulting refocusing of the waves to the source point on a space-time graph. Reconstructed time-reversed waves shown on a space-time graph. The wave amplitude (along a vertical line through the source point) is plotted against time. We also demonstrated that the refocusing can be done at any desired location by increasing the number of source and recording points. Crucially, because the play back involves a computational step, one can vary the number of play back points with ease and investigate the fidelity of the refocusing on length scales two orders of magnitude smaller than previously possible. This technique will help researchers to nondestructively evaluate microdots, microcontacts or microdefects, or to investigate multiple scattering in GHz waveguides, chaotic acoustic microcavities or anisotropic crystallites. (For more details, see 'Microscale multiple scattering of coherent surface acoustic wave packets probed with gigahertz time-reversal acoustics,' V. Tournat, D. M. Profunser, E. Muramoto, O. Matsuda, T. Takezaki, S. Sueoka and O. B. Wright, Phys. Rev. E, 74, 026604, 2006).